Craftsy is having a Spring Sale! 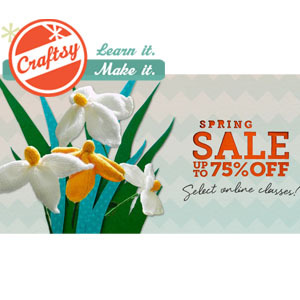 Starting today through April 8th, a different set of Craftsy classes will be on sale each day, up to 75% off their normal price. Don’t see the class you want on sale? Check back tomorrow – a fresh pick of courses will be on sale! Saturday will have the most classes on sale, so make sure to visit Craftsy.com for sure that day!